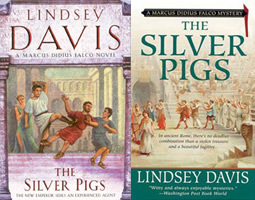 Marcus Didius Falco, a Roman ‘informer’ in 70AD, is standing in the Forum one very hot day, aiming to become a classic gumshoe in the Ancient World genre of mystery fiction… At this early point in his career, he has not only to make his way in the snobbish and dangerous milieu of Vespasian’s Rome, but to overcome the prejudice amongst publishers, booksellers and readers who are wary of historical novels and off-beat settings. Our hero takes himself to Britain; there the weather is filthy, the natives are restless, the women are angry, and his mission turns into a nightmare from which he only narrowly escapes alive. Along the way he meets brutes, traitors, his mother, sellers of seedy snacks, a blonde young lady who thinks he’s wonderful, the Emperor – and Helena Justina, whom the author had intended to be the chief conspirator – but who turned out to be far too spirited for that. This is the one with the ‘Bath will never have anything made of it’ joke. Research Note: No, I didn’t investigate the brothel myself. New edition with Author's Introduction.